Genome instability is associated with human cancers and chromosome breakage syndromes, including Bloom's syndrome, caused by inactivation of BLM helicase. Numerous mutations that lead to genome instability are known, yet how they interact genetically is poorly understood. We show that spontaneous translocations that arise by nonallelic homologous recombination in DNA-damage-checkpoint-defective yeast lacking the BLM-related Sgs1 helicase (sgs1Δ mec3Δ) are inhibited if cells lack Mec1/ATR kinase. Tel1/ATM, in contrast, acts as a suppressor independently of Mec3 and Sgs1. Translocations are also inhibited in cells lacking Dun1 kinase, but not in cells defective in a parallel checkpoint branch defined by Chk1 kinase. While we had previously shown that RAD51 deletion did not inhibit translocation formation, RAD59 deletion led to inhibition comparable to the rad52Δ mutation. A candidate screen of other DNA metabolic factors identified Exo1 as a strong suppressor of chromosomal rearrangements in the sgs1Δ mutant, becoming even more important for chromosomal stability upon MEC3 deletion. We determined that the C-terminal third of Exo1, harboring mismatch repair protein binding sites and phosphorylation sites, is dispensable for Exo1's roles in chromosomal rearrangement suppression, mutation avoidance and resistance to DNA-damaging agents. Our findings suggest that translocations between related genes can form by Rad59-dependent, Rad51-independent homologous recombination, which is independently suppressed by Sgs1, Tel1, Mec3 and Exo1 but promoted by Dun1 and the telomerase-inhibitor Mec1. We propose a model for the functional interaction between mitotic recombination and the DNA-damage checkpoint in the suppression of chromosomal rearrangements in sgs1Δ cells. Eukaryotic cells have mechanisms at their disposal for the detection and repair of spontaneous and induced DNA lesions, thus preventing them from giving rise to potentially abnormal daughter cells. However, if these mechanisms are defective or overwhelmed by damage, deleterious chromosomal rearrangements can arise. A multitude of genes and genetic pathways for the maintenance of genome stability has been identified mostly using genetic screens in simple model organisms such as the yeast Saccharomyces cerevisiae. They include DNA damage checkpoints, DNA repair factors and proteins for processing of recombination substrates and intermediates [1–10]. The importance of the same mechanisms for maintaining genome stability in human cells is highlighted by the association of mutations in the human homologues of these yeast genes with chromosome breakage syndromes, which are characterized by signs of premature aging and/or cancer development. The syndromes include Nijmegen breakage syndrome associated with mutations in NBS1, the homologue of yeast XRS2 [11–13]; Bloom's syndrome and Werner syndrome associated with mutations in BLM and WRN , respectively, both related to yeast SGS1 [14, 15]; and ataxia telangiectasia associated with mutations in ATM , which is related to yeast TEL1 . Yeast SGS1 encodes a 5' to 3' DNA helicase that preferentially unwinds three- and four-way junctions typical of replication and recombination intermediates and has recently been shown to collaborate with Exo1 in the long-range processing of double-strand breaks (DBSs) [18–21]. Without Sgs1, cells accumulate gross-chromosomal rearrangements (GCRs), exhibit elevated levels of mitotic recombination, have a reduced replicative lifespan and are sensitive to chemicals that alkylate DNA or slow replication forks [2, 22–26]. Among DNA-damage checkpoint components, Mec1 kinase, also considered the homolog of mammalian ATR [27–29], has been identified as one of the strongest suppressors of GCRs in yeast [3, 4]. 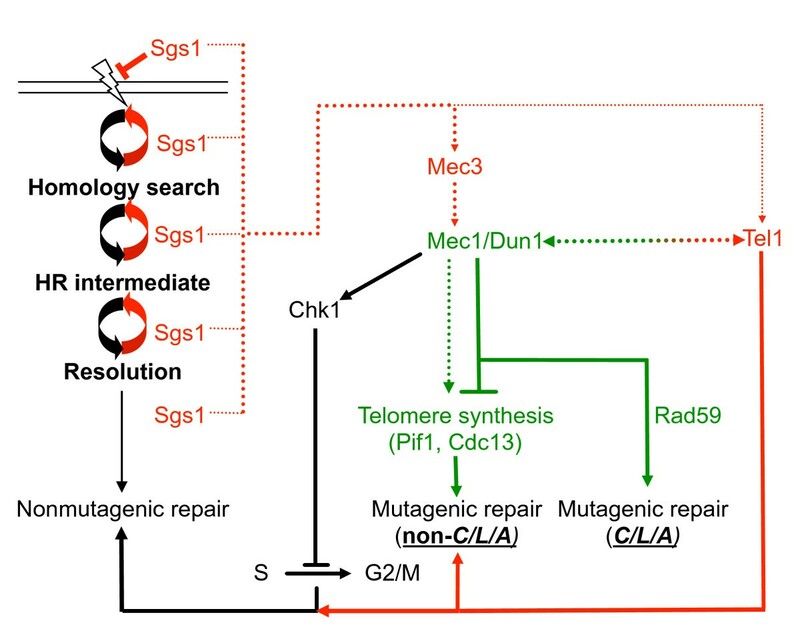 Other cellular phenotypes of mec1Δ mutants include increased sensitivity to DNA damaging agents and deficient DNA-damage checkpoint response , instability of stalled forks , accumulation of DNA breaks  and, in addition to these mitotic defects, deficiencies in meiotic checkpoint activation and recombination [33–35]. In contrast to Mec1, cells lacking the Tel1 checkpoint kinase, which is related to mammalian ATM [17, 36], are not sensitive to DNA damaging agents , do not accumulate GCRs above wildtype levels , but show telomere erosion . Synergistic interactions between mec1Δ and tel1Δ mutations have been reported for many phenotypes, suggesting a functional relationship and redundancy between the two kinases [3, 17, 37, 38]. Other checkpoint components, such as those involved in sensing DNA damage (Mec3, Rad24), appear to have only small to moderate roles in suppressing GCRs in yeast [3, 4]. In cells lacking the Sgs1 helicase, however, Mec3 and Rad24 strongly suppress overall genome instability [3, 4] as well as the formation of spontaneous, recurring translocations between short identical sequences in non-allelic, but related, DNA sequences . Utilizing the high susceptibility of the sgs1Δ mec3Δ mutant to recurring translocation formation between CAN1, LYP1 and ALP1, we have in the current study conducted a candidate screen to identify two types of DNA metabolic factors - those that are required for the formation of recurring translocations in the sgs1Δ mec3Δ mutant and those that act independently of Sgs1 and Mec3 to suppress translocations. For this purpose, mec1Δ, tel1Δ, dun1Δ, chk1Δ and rad59Δ mutations were introduced into the sgs1Δ mec3Δ mutant and the accumulation of recurring translocations was assessed. We further determined how the lack of other DNA metabolic factors (yen1Δ, lig4Δ, exo1Δ, rad1Δ, pol32Δ) affects the accumulation of genome rearrangements, identifying a strong synergistic interaction between sgs1Δ and exo1Δ. We propose an integrated model for independent, functional interactions between Sgs1, HR subpathways and various DNA-damage-checkpoint branches in the suppression of chromosomal rearrangements. Chromosomal translocations between short stretches of homology in nonallelic sequences that are naturally present in the yeast genome, such as the highly similar, but diverged CAN1 (on chromosome V), ALP1 and LYP1 genes (on chromosome XIV, 60-65% identity) , are normally suppressed in yeast. However, they are recurrent in sgs1Δ mutants with certain additional DNA-metabolic defects, including mec3Δ, rad24Δ, cac1Δ, asf1Δ and rfc5-1 . One of the mutants most susceptible to recurring translocations between the CAN1, LYP1 and ALP1 loci is the sgs1Δ mec3Δ mutant, whereas translocations are not found in the sgs1Δ mec1Δ mutant . Here, we wanted to test whether the lack of CAN1/LYP1/ALP1 translocations in the sgs1Δ mec1Δ mutant meant that Mec1 was not a suppressor of translocations and therefore its deletion had no affect on translocation formation, or that Mec1 was actually required for the formation of viable chromosomal translocations. If the latter was true, we expected that introducing a mec1Δ mutation into the highly susceptible sgs1Δ mec3Δ strain should inhibit the accumulation CAN1/LYP1/ALP1 translocations. Indeed, we found that while deleting MEC1 led to a synergistic increase (~ 7-fold) in the rate of all GCR types compared to the sgs1Δ mec3Δ mutant (P < 0.0001), screening of GCR clones obtained from 431 individual sgs1Δ mec3Δ mec1Δ cultures failed to reveal a single CAN1/LYP1/ALP1 translocation, signifying a > 7-fold decrease in the translocation rate compared to the sgs1Δ mec3Δ mutant (Table 1). The synergistic GCR rate increase in the sgs1Δ mec3Δ mec1Δ mutant shows that Mec1 can activate its targets through Mec3-independent sensing of DNA damage. This may occur by Mec1-Ddc2 itself recognizing and binding to DNA lesions [39, 40] or through DNA-damage sensors other than the Mec3 clamp signaling to Mec1. The synergistic GCR rate increase in the sgs1Δ mec3Δ mec1Δ mutant also indicates that the failure to form CAN1/LYP1/ALP1 translocations when MEC1 is deleted is not due to an inability to form viable GCRs, but rather suggests that DNA lesions are channeled into GCR pathways other than homology-driven translocation. Most likely, Mec1 promotes chromosomal translocations by inhibiting de novo telomere synthesis at chromosome breaks , for example by phosphorylating the telomerase-inhibitor Pif1  and by phosphorylating Cdc13 and thus preventing its accumulation at DNA breaks . In a haploid wildtype cell, these chromosomal translocations are expected to be rare due to restraints placed on homologous recombination events by the need for relative long regions of sequence identity. However, when the restraints on homologous recombination are relaxed and spontaneous DNA lesions are not properly detected by the DNA-damage checkpoint, as could be assumed for the sgs1Δ mec3Δ mutant, chromosomal translocations are promoted and occur between much shorter regions of sequence identity, such as the 5-41-bp segments present in CAN1, LYP1 and ALP1. Functional interaction between Sgs1 and components of the DNA-damage checkpoint in the suppression of GCRs and translocations between CAN1, LYP 1 and ALP1 genes. a GCR rate (Canr 5-FOAr × 10-10). 95% confidence intervals (CIs) for median GCR rates were calculated according to Nair , where non-overlapping confidence intervals indicate statistically significant differences between median GCR rates. GCR rates of wildtype , sgs1 , mec3, sgs1 mec3 , tel1  were reported previously. b Rate of accumulating translocations between CAN1, LYP1 and/or ALP1 genes (x 10-10). GCR clones from sgs1, mec3, sgs1 mec3, sgs1 tel1 and sgs1 mec1 were previously screened for CAN1/LYP1/ALP1 translocations [10, 60]. c Types of CAN1/LYP1/ALP1 translocations were determined by sequencing. Of the 20 CAN1/LYP1/ALP1 translocations identified among 150 GCR clones from the sgs1 mec3 mutant, 17 were identified as being either C/A, C/L/A or C/L translocations and 3 clones had a mixture of multiple translocations . d All mutants with a mec1 deletion also contain a sml1 deletion. Deleting TEL1, which encodes another DNA-damage checkpoint kinase that is considered at least partially functionally redundant with Mec1, had the same effect as deleting MEC1 on the accumulation of all types of GCR (Table 1), as evidenced by the 44-fold increase in the overall GCR rate compared to the sgs1Δ mec3Δ mutant (5.7 × 10-6 versus 1.3 × 10-7, P < 0.0001). However, deleting TEL1 had the opposite effect on CAN1/LYP1/ALP1 translocation formation (Table 1). Instead of inhibiting CAN1/LYP1/ALP1 translocations like the mec1Δ mutation, the tel1Δ mutation led to an increase (~15-fold) in CAN1/LYP1/ALP1 translocations (Table 1). Unlike mec1Δ mutants, mutants lacking Tel1 are impaired in their ability to maintain telomeres  and may thus be unable to heal DNA breaks by de novo telomere addition. Thus, in the absence of Tel1, DNA breaks may be channeled into alternative pathways for repair, such as HR, and more frequently give rise to CAN1/LYP1/ALP1 rearrangements under conditions that favor aberrant HR such as those in the sgs1Δ mec3Δ mutant. That failure to activate either Tel1 or Mec3-checkpoint pathways contributes independently to recurrent CAN1/LYP1/ALP1 translocation formation suggests that both ssDNA overhangs or gaps, thought to be sensed in a Mec3-dependent manner, and DSBs, thought to be sensed in a Tel1-dependent manner, can lead to CAN1/LYP1/ALP1 translocations and that they accumulate in unperturbed sgs1Δ cells spontaneously. The synergistic increase in overall genome instability in the sgs1Δ mec3Δ tel1Δ mutant might also indicate that in the absence of lesion binding by the Mec3 clamp some lesions are further processed and eventually detected by the Tel1-dependent pathway. For example, a stalled replication fork might eventually be processed into double-stranded ends in an attempt at fork restart by fork regression or template-switching. Thus, both Tel1 and Mec1 act independently of Mec3 and Sgs1 to strongly suppress overall genome instability, but they affect CAN1/LYP1/ALP1 translocation formation in opposite ways. The inhibition of CAN1/LYP1/ALP1 translocations upon MEC1 deletion as opposed to their increase upon TEL1 deletion can most likely be explained by their opposite effects on telomere synthesis, with Mec1 inhibiting it and Tel1 promoting it. This is also consistent with the previous report of different GCR spectra in the tel1Δ and mec1Δ single mutants . Apart from regulating telomere maintenance factors, it is also conceivable that the DNA-damage checkpoint-dependent phosphorylation of homologous recombination factors, such as Rad55, Slx4 and Mus81 [43–47] contributes to differential regulation of translocation formation in the sgs1Δ mec3Δ mutant. The opposing effects of Tel1 and Mec1 on CAN1/LYP1/ALP1 translocation formation led us to investigate other DNA-damage checkpoint components in sgs1Δ and sgs1Δ mec3Δ mutants. We found that deletion of either CHK1 or DUN1 led to a synergistic increase in overall genome instability when combined with an sgs1Δ mutation (P < 0.0001), however only the dun1Δ mutation caused a further significant GCR rate increase in the sgs1Δ mec3Δ mutant (P < 0.0001, Table 1) whereas the chk1Δ mutation did not (P = 0.1615, Table 1). Analysis of the GCR types revealed accumulation of CAN1/LYP1/ALP1 translocations in the Chk1-deficient sgs1Δ mec3Δ mutant at a similar rate as in the sgs1Δ mec3Δ mutant, but not in the Dun1-deficient sgs1Δ mec3Δ mutant (Table 1), indicating that Dun1, like Mec1, promotes translocation events between CAN1, LYP1 and ALP1 whereas Chk1 does not. This is likely due to Mec1-mediated activation of Dun1 kinase, which in turn inactivates the transcription repressor Crt1, thus allowing transcription of several DNA-damage inducible genes [48, 49]. Chk1 kinase is also activated through Mec1 in response to DNA damage and causes a transient G2/M arrest by blocking anaphase progression [50, 51]. However, in contrast to Dun1, Chk1 is not thought to regulate DNA repair pathways, and its deletion did not inhibit translocation formation in the sgs1Δ mec3Δ mutant (Table 1). As expected, deletion of RAD17, which encodes another subunit of the Mec3/Rad17/Ddc1 checkpoint clamp, had a similar effect on CAN1/LYP1/ALP1 translocation formation in the sgs1Δ tel1Δ mutant as deletion of MEC3 (Table 1). The detection of a CAN1/LYP1/ALP1 translocation in two strains that expressed wildtype Sgs1 (mec3Δ tel1Δ (Table 1) and mec3Δ tel1Δ rad17Δ (not shown)) suggests that even in the presence of wildtype Sgs1 cells may accumulate CAN1/LYP1/ALP1 translocations as long as they are deficient in at least two independent suppressors of translocation formation, such as Tel1 and Mec3 identified here. We previously showed that translocations between CAN1, LYP1 and ALP1 in the sgs1Δ mec3Δ mutant are Rad52-dependent, but translocations still formed when Rad51 was absent . To assess the role of other HR factors in translocation formation we deleted RAD59 in the highly susceptible sgs1Δ mec3Δ mutant and measured the rate of accumulating all types of GCRs as well as CAN1/LYP1/ALP1 translocations. One CAN1/LYP1/ALP1 rearrangement was identified among GCR clones obtained from 158 independent cultures of the sgs1Δ mec3Δ rad59Δ mutant (Table 2), indicating a 10-fold reduction in the CAN1/LYP1/ALP1 translocation rate compared to the sgs1Δ mec3Δ mutant. Thus, similar to Rad52, Rad59 is required for interchromosomal translocations between short identical sequences in related genes. If Rad59 was indeed required for translocation formation, we predicted that the formation of CAN1/LYP1/ALP1 translocations in the sgs1Δ mec3Δ rad51Δ mutant would also be inhibited by a rad59Δ mutation. Thus, we generated an sgs1Δ mec3Δ rad51Δ rad59Δ mutant and screened for CAN1/LYP1/ALP1 translocations. Among 168 independent GCR clones we identified one CAN1/LYP1/ALP1 translocation, indicative of a 28-fold reduction of the translocation rate compared to the sgs1Δ mec3Δ rad51Δ mutant (Table 2). Thus translocations between CAN1, LYP1 and/or ALP1 can form through Rad52/Rad59-mediated HR that does not require Rad51. Rad59 has recently also been shown to contribute to GCRs mediated by certain Ty-elements and to translocations involving short DNA sequences of limited sequence identity [6, 52]. Effect of homologous recombination mutations on the ability of the sgs1 mec3 mutant to accumulate GCRs and form rearrangements between the CAN1, LYP 1 and ALP1 genes. a Median rate of cells resistant to canavanine and 5-FOA (Canr 5-FOAr × 10-10). 95% confidence intervals (CIs) for median GCR rates were calculated according to Nair , where non-overlapping confidence intervals indicate statistically significant differences between median GCR rates. GCR rates for wildtype , sgs1 , mec3, sgs1 mec3 , rad51, sgs1 mec3 rad51 and sgs1 mec3 rad52 mutants  were reported previously and are included for comparison. b Rate of accumulating translocations between CAN1, LYP1 and/or ALP1 (Canr 5-FOAr × 10-10). GCR clones from sgs1, mec3, sgs1 mec3, sgs1 mec3 rad51, sgs1 mec3 rad52 were previously screened for CAN1/LYP1/ALP1 translocations [10, 60]. ND, not determined. c To determine 95% CIs for sgs1 mec3 rad51 and sgs1 mec3 rad52 mutants, GCR rates were re-measured for the current study. The GCR rate for the sgs1 mec3 rad51 mutant was 1933 × 10-10 (95% CIs: 601-2240 × 10-10) and the GCR rate for the sgs1 mec3 rad52 mutant was 2220 × 10-10 (951-3470 × 10-10). The previously reported rates fall within the 95% CIs determined in the current study. While Rad52 is required for all HR in yeast, some DNA breaks can be repaired by HR pathways that do not require Rad51, including single-strand annealing (SSA), break-induced replication (BIR) and recombination-mediated telomere-lengthening Type II [53–58]. SSA is a mechanism for the repair of a DSB between repeated DNA elements and requires Rad59, but not Rad51 . In order for the interchromosomal CAN1/LYP1/ALP1 rearrangements to arise by SSA, however, at least two DSBs would have to occur in the same cell - one DSB within or downstream of CAN1 on chromosome V and one DSB near ALP1 (or LYP1) on chromosome XIV. Resection would expose the short stretches of homology shared by CAN1 and ALP1 (or LYP1) , allowing them to anneal, followed by removal of the nonhomologous overhangs and ligation. Rad59-dependent, Rad51-independent interchromosomal translocation between his3 fragments was recently shown after induction of HO-breaks in the two recombining chromosomes . Such an interchromosomal SSA event could also produce the types of rearrangements we have observed between CAN1, LYP1 and ALP1; however, the ends of chromosomes V and XIV not engaged in the SSA event would be left unrepaired and most likely would be lost after cell division unless the recombination event occurs in G2/M when sister-chromatids are present. Moreover, since we have shown that wildtype copies of LYP1 and ALP1 are still present in recombinants with CAN1/LYP1/ALP1 rearrangements, indicative of a nonreciprocal translocation event , and the parts of chromosome XIV that would be lost after SSA contain essential genes, SSA is unlikely to be the main recombination mechanism that gives rise to CAN1/LYP1/ALP1 rearrangements. Besides SSA, BIR also matches the genetic requirements for CAN1/LYP1/ALP1 translocation formation. BIR is initiated by invasion of a duplex by a single-stranded 3'end of a one-sided DBS followed by replication to the chromosome end. Although Sgs1 has roles in recombination, specifically sister-chromatid exchange and resolution of recombination intermediates [2, 9, 62–64], it is not required for Rad51-independent BIR . In contrast to SSA, the nonreciprocal nature of BIR events would maintain an intact copy of chromosome XIV in addition to the chromosome V/XIV translocation, suggesting that it is the more likely mechanism involved in CAN1/LYP1/ALP1 translocation. BIR has been implicated in the repair of one-sided DSBs, such as replication forks that collapsed at a single-strand break. BIR is also thought to allow telomerase-deficient cells (tlc1Δ), whose telomeres have shortened to a point where cells can no longer proliferate, to survive by extending what could be considered a one-sided DSB. Survivors can arise either by adding subtelomeric Y' elements in a Rad51-dependent mechanism (Type I) or by adding telomeric (G1-3T)n repeats in a Rad51-independent, but Rad59-dependent mechanism (Type II) [53–55]. The differential requirement for Rad51 and Rad59 in these two pathways is thought to result from the differences in length and sequence identity of the recombination substrates for Type I and Type II . The long, nearly identical (~1% variation within the same strain) Y' elements  are thought to be better substrates for Rad51-mediated strand invasion, whereas Rad59 is able to use the shorter stretches of homology likely to be found within the highly variable (G1-3T)n repeats . Besides BIR, evidence of homology-length dependency is also seen in gene conversion, with Rad59 becoming increasingly important as the length of sequence homology decreases . This length-dependency may also explain our observation that CAN1/LYP1/ALP1 rearrangements, which show short regions of homology at the breakpoints [10, 60], are inhibited by deletion of RAD59, but not by deletion of RAD51. Despite this differential effect on chromosome rearrangements between CAN1, LYP1 and ALP1, we observed no difference in the rate of overall genome instability between sgs1Δ mec3Δ rad51Δ and sgs1Δ mec3Δ rad59Δ mutants (P = 0.6892, Table 2), suggesting that the DNA lesions that give rise to viable GCRs are accessible to multiple repair pathways. To assess the possible role of other DNA metabolic factors in the suppression or formation of GCRs in cells lacking Sgs1, we introduced exo1Δ, pol32Δ, rad1Δ, lig4Δ and yen1Δ mutations into sgs1Δ and sgs1Δ mec3Δ mutants. Screening of the single, double and triple mutants revealed that RAD1, POL32, LIG4 and YEN1 are not strong suppressors of GCRs in wildtype cells, or in sgs1Δ or sgs1Δ mec3Δ mutants (Table 3). However, when we assessed the formation of CAN1/LYP1/ALP1 translocations in sgs1Δ mec3Δ mutants with pol32Δ or rad1Δ mutations we found that in both triple mutants CAN1/LYP1/ALP1 translocations were inhibited, revealing one CAN1/LYP1 translocation among 98 independent GCR clones in the sgs1Δ mec3Δ pol32Δ mutant and none (0/55) in the sgs1Δ mec3Δ rad1Δ mutant. Pol32, a nonessential subunit of polymerase δ that promotes processivity of the polymerase, is not required for SSA, but for DNA repair processes that involve extensive DNA synthesis, such as BIR , consistent with BIR being a pathway for CAN1/LYP1/ALP1 translocation formation. Although Rad1, a subunit of the Rad1-Rad10 nuclease critical for the removal of nonhomologous overhangs from annealed single strands in processes such as SSA [67, 68], has not been shown to be required for BIR, it has been implicated in the removal of nonhomologous overhangs during GCR formation  and in recombination events that combine BIR and SSA processes [70, 71]. a Strains with multiple gene deletions were constructed by sporulation of the appropriate heterozygous diploids. GCR rates with 95% confidence intervals (CIs) for wildtype , sgs1 , sgs1 mec3  and lig4  were reported previously and are included for comparison. Spores with both sgs1Δ and pol32Δ mutations grew very slowly and exhibited a low viable cell count on YPD in the GCR assay. b The rate of accumulating gross-chromosomal rearrangements (GCRs) is calculated by selecting for cells resistant to canavanine (Canr) and 5-fluoro-orotic acid (5-FOAr) and is expressed as Canr 5-FOAr × 10-10 .
c 95% confidence intervals (CI) for median GCR rates were calculated according to Nair . Deletion of EXO1, coding for a nuclease with 5' to 3' exonuclease and flap-endonuclease activities, which has roles in mitotic and meiotic recombination as well as mutation avoidance and is thought to cooperate with Sgs1 in the processing of DSBs [19, 72], induced the largest synergistic GCR rate increase we have observed to date in the sgs1Δ mutant. While sgs1Δ and exo1Δ single mutants exhibited moderately increased GCR rates compared to wildtype, the GCR rate of the sgs1Δ exo1Δ mutant was several hundred-fold higher than the rates of the single mutants (P < 0.0001, Table 3). This GCR rate increased another 26-fold upon deletion of MEC3 (P < 0.0001, Table 3). Screening of GCRs obtained from 66 independent cultures of the sgs1Δ mec3Δ exo1Δ mutant identified two CAN1/LYP1/ALP1 translocations, indicating a ~ 200-fold increase in the CAN1/LYP1/ALP1 translocation rate compared to the sgs1Δ mec3Δ mutant (3.5 × 10-6 versus 1.7 × 10-8). Exo1 contains conserved N-terminal N- and I-nuclease domains, apparently separated by a short disordered linker, and binding sites for the mismatch repair (MMR) proteins Mlh1 and Msh2 have been located within the C-terminal half of Exo1 [72–74], which is predicted to be intrinsically disordered (Figure 1A). Four phosphorylation sites (S372, S567, S587, S692) required for the regulation of the DNA-damage response have also been located in the disordered C-terminus . To determine if the C-terminus of Exo1 plays a role in the suppression of genome instability in the sgs1Δ mutant we constructed a set of C-terminal deletions ranging from 100 to 400 residues (Figure 1A and 1B). We found that the C-terminal 260 residues of Exo1, making up 37% of the protein, play no major role in suppressing the accumulation of GCRs in the sgs1Δ mutant (Table 4). To test the possibility that the C-terminus with its binding sites for MMR proteins might be required for Exo1's role in mutation avoidance, but not for its role in suppressing GCRs, we utilized a fluctuation assay to determine the rate of accumulating canavanine resistance (Canr) mutations in strains expressing the various C-terminal Exo1 truncations (Table 5). As in the GCR assay, deletion of up to 260 residues had no effect on the Canr mutation rate (P = 0.3524) whereas deletion of 280 or more residues caused a null phenotype (P = 0.0001). Similarly, only deletion of 280 or more residues caused sensitivity to methyl methanesulfonate (MMS) (Figure 1C). No sensitivity to 200 mM hydroxyurea was observed for any of the exo1 mutants (Figure 1C). Thus, deletion of up to 260 residues caused a phenotype similar to wildtype in all assays tested here, whereas deletion of 280 or more residues caused a null (exo1Δ) phenotype. Expression of C-terminal truncations of Exo1 and sensitivity to DNA-damaging agents. (A) Intrinsic disorder prediction of Exo1 using the IUPred algorithm in which values above 0.5 indicate residues predicted to be intrinsically disordered and values below 0.5 to be ordered. The N-terminus, harboring conserved N- and I-nuclease domains, is predicted to be ordered, whereas the C-terminus, which appears devoid of enzymatic activity but contains phosphorylation sites and sites for interaction with mismatch repair proteins, is disordered. The sites at which the Exo1 truncations examined in this study terminate are indicted by vertical dotted lines. The location of conserved domains was adapted from reference : nuclease domains (orange boxes, 16-96 aa, 123-257 aa), Mlh1 interaction domain (green box, 400-702 aa) and the Msh2 interaction domain (blue box, 368-702 aa). Phosphorylation sites at S372, S567, S587 and S692, implicated in checkpoint regulation , are indicated by red asterisks. 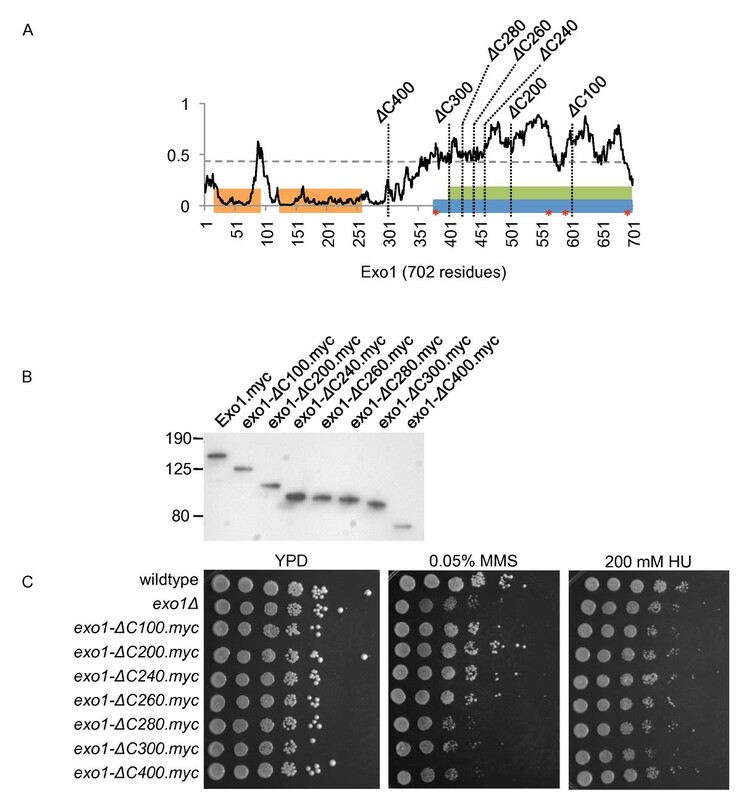 (B) Western blot analysis of expression of myc-epitope tagged exo1 truncations and wildtype Exo1. Molecular weight markers (kD) are indicated on the left. (C) Cells expressing Exo1 truncations lacking 280 or more C-terminal residues are as sensitive to 0.05% MMS as the exo1Δ mutant whereas cells expressing exo1 truncations lacking 260 or fewer C-terminal residues show wildtype levels of resistance to MMS. No sensitivity to 200 mM hydroxyurea was observed for any of the tested yeast strains. Effect of exo1 mutations on the accumulation of GCRs in wildtype cells or cells lacking Sgs1 helicase. a 95% confidence intervals (CI) for median GCR rates were calculated according to Nair . Effect of C-terminal deletions of Exo1 on the spontaneous mutation rate at the CAN1 locus. a 95% confidence intervals (CI) for median Canr rates were calculated according to Nair . In addition to providing MMR protein interaction sites, the C-terminus of Exo1 contains four phosphorylation sites (S372, S567, S587, S692), which were recently shown to be important for the regulation of the DNA damage checkpoint in response to uncapped telomeres in a cdc13-1 mutant . Unlike in a cdc13-1 mutant, we did not detect Exo1 phosphorylation in the sgs1Δ mutant (data not shown), and deletion of the C-terminal third of Exo1 (exo1-ΔC260), which contains three of the four phosphorylation sites (S567, S587, S692), had no effect on Exo1 function in the assays used here (Canr mutation rate, GCR assay, MMS sensitivity). The fourth phosphorylation site (S372) is present in both the exo1-ΔC260 mutant and the exo1-ΔC280 mutant and, therefore, is not responsible for the different phenotypes associated with the two alleles. Thus, the known phosphorylation sites in Exo1 do not appear to be required for Exo1's role in mutation avoidance, resistance to MMS or suppression of GCRs in a sgs1Δ mutant. Instead, it is likely that the ΔC280 deletion affects Exo1 nuclease activity directly by disrupting intramolecular interactions with the N-terminus. The loss of yet unknown posttranslational modifications in this segment of Exo1 or an indirect effect caused by the loss of interaction with other cellular factors could also lead to the deficiency of the exo1ΔC280 allele. Besides the overall increase in genome instability, CAN1/LYP1/ALP1 rearrangements seen in the sgs1Δ mec3Δ mutant were also present in the sgs1Δ mec3Δ exo1Δ mutant. Normally, Exo1 and Sgs1 function in independent end resection pathways that cooperate in the processing of DSBs, especially the long-range resection of the 5'-strand [19, 20], and Marrero and Symington  recently showed that this extensive resection inhibits BIR in a plasmid-based assay. Besides upregulation of BIR, which was also accompanied by chromosome rearrangements, the exo1Δ sgs1Δ mutant was also more proficient in de novo telomere synthesis at HO-endonuclease-induced chromosome breaks [18, 21]. The combination of increased BIR and more efficient de novo telomere addition, both of which have been identified as major mechanisms for the healing of chromosome V breaks in the GCR assay [76, 77], likely also explains the remarkably strong accumulation of genome rearrangements originating from spontaneous DNA lesions in the exo1Δ sgs1Δ mutant studied here. Our study further adds that the exo1Δ sgs1Δ mutant has even greater potential for the accumulation of viable genome rearrangements, which is suppressed (~ 26-fold) in the sgs1Δ exo1Δ mutant by Mec3-dependent DNA-damage checkpoint functions (P < 0.0001). Nonhomologous endjoining does not appear to be a significant source for these genome rearrangements, as indicated by the lack of any effect of LIG4 gene deletion in mutants with various combinations of sgs1Δ, exo1Δ and mec3Δ mutations (e.g., GCR rate of sgs1Δ mec3Δ exo1Δ compared to sgs1Δ mec3Δ exo1Δ lig4Δ, P = 0.3953, Table 3); however, it is also plausible that in the absence of one repair pathway DNA lesions simply become substrates for various other available repair pathways. Our results indicate that spontaneous, interchromosomal translocations between short regions of sequence identity (5-41 bp), such as those present in the CAN1, LYP1 and ALP1 genes used in our assay, are promoted by Mec1/Dun1/Rad59-dependent pathways whereas Tel1, Mec3 and Sgs1 act as independent suppressors (Figure 2). The requirement for Pol32 and Rad1 in the translocation process further suggests the need for extensive DNA synthesis, such as seen in BIR, and the removal of nonhomologous overhangs from annealed single-strands, critical for SSA and implicated in GCR formation. Exo1 nuclease is a suppressor of overall genome rearrangements as well as CAN1/LYP1/ALP1 translocations when cells lack Sgs1 or both Sgs1 and Mec3. That the disordered, C-terminal third is dispensable for Exo1 function in our assays further indicates that physical interaction with MMR proteins in this region and regulation of Exo1 function in response to DNA-damage are not important for Exo1's role in the suppression of spontaneous GCRs, mutation avoidance and resistance to MMS. Factors affecting the suppression and promotion of chromosomal translocations between short segments of homology in CAN1 , LYP1 and ALP1 in cells lacking Sgs1. In the absence of Sgs1, translocations between CAN1, LYP1 and ALP1 (referred to as C/L/A) are independently suppressed by the checkpoint components Mec3 and Tel1 (shown in red font), as suggested by the synergistic increases in the GCR rate and the C/L/A translocation rate of the sgs1Δ mutant upon deletion of MEC3 (sgs1Δ mec3Δ) and subsequently TEL1 (sgs1Δ mec3Δ tel1Δ). If Mec3 is absent (sgs1Δ mec3Δ), C/L/A translocations form through a pathway that requires Mec1, Dun1 and homologous recombination (HR) factors (shown in green font), especially Rad52 and Rad59. Mec1 most likely promotes translocations by inhibiting de novo telomere additions by regulating Pif1 and Cdc13. In addition to mutagenic repair that leads to C/L/A translocations, other types of mutagenic repair (e.g., translocations between other genes, de novo telomere additions, deletions, insertions, inversions) and most likely also nonmutagenic repair products are formed. If, in addition to Mec3, Tel1 is also absent (e.g., sgs1Δ mec3Δ tel1Δ), an even greater number of DNA lesions are channeled through the Mec1-dependent, C/L/A-promoting pathway. In contrast to dun1Δ, the chk1Δ mutation does not lead to a significant GCR rate increase in the sgs1Δ mec3Δ mutant and does not inhibit C/L/A translocation formation. Possibly, the inability to regulate cell cycle progression in the absence of Chk1 leads to increased formation of inviable GCRs. Dotted lines indicate events that occur in the absence of the protein from which the arrow originates; full lines indicate events that occur in the presence of the protein. All strains used in this study are derived from KHSY802 (MATa, ura3-52, trp1Δ63, his3Δ200, leu2Δ1, lys2Bgl, hom3-10, ade2Δ1, ade8, hxt13::URA3) or the isogenic strain of the opposite mating type. Desired gene deletions were introduced by HR-mediated integration of PCR products containing a selectable marker cassette flanked by 50-nt sequences complementary to the target locus . C-terminal truncations of Exo1 were constructed by replacing the desired DNA sequence at the chromosomal EXO1 locus with a myc-epitope encoding sequence amplified from pFA-13Myc.His3MX6 (a gift from Mark Longtine, Washington University, St. Louis). Expression of Exo1 truncation alleles was confirmed by Western blotting using monoclonal anti-c-myc antibody (Covance). All haploid strains with multiple gene deletions were obtained by sporulating diploids heterozygous for the desired mutations to minimize the risk of obtaining suppressors. This was especially important for combinations of mutations known to cause fitness defects, such as sgs1Δ and pol32Δ. Spore isolation was followed by genotyping of meiotic products by spotting on selective media or by PCR. All strains used in this study are listed in Table 6. Media for propagating yeast strains have been previously described [76, 77]. a RDKY strains were a kind gift from Richard Kolodner (Ludwig Institute for Cancer Research, University of California - San Diego). Cell cultures were grown in yeast extract/peptone/dextrose (YPD) media and adjusted to OD600 = 1. Tenfold dilutions were spotted on YPD, YPD supplemented with 0.05% methyl-methanesulfonate (MMS) and YPD supplemented with 200 mM hydroxyurea (HU). Colony growth was documented after incubation at 30°C for 3 days. Rates of accumulating spontaneous gross-chromosomal rearrangements (GCRs) were determined by fluctuation analysis and the method of the median as previously described [77, 79]. Cells with GCRs were detected by their resistance to canavanine and 5-fluoro-orotic acid (Canr 5-FOAr) due to simultaneous inactivation of the CAN1 and URA3 genes, both located within a 12 kb nonessential region on the left arm of chromosome V. The median GCR rate is reported with 95% confidence intervals . GCR clones were screened by PCR to identify clones with rearrangements between CAN1 on chromosome V and LYP1 and/or ALP1 (collectively referred to as CAN1/LYP1/ALP1 rearrangements in the text), located in opposite orientations on the same arm of chromosome XIV . To determine the rate of accumulating spontaneous mutations that lead to inactivation of the CAN1 gene, 3-ml YPD cultures expressing wildtype Exo1 or C-terminal truncations of Exo1were grown overnight and aliquots were plated on synthetic media lacking arginine (US Biological) supplemented with 240 mg ml-1 canavanine (Sigma), and on YPD to obtain the viable cell count. Colonies were counted after two days of incubation at 30°C. At least twelve independent cultures from three isolates were analyzed per yeast strain. The median Canr mutation rate is reported with 95% confidence intervals . Statistical significance of differences in GCR rates was evaluated by using the Mann-Whitney test and programs from Dr. R. Lowry at Vassar College http://faculty.vassar.edu/lowry/VassarStats.html. Cells were grown in YPD until they reached OD600 = 0.5. Whole cell extract was prepared from 5 ml of culture using a standard trichloroacetic acid (TCA) extraction. Briefly, cells were pelleted, vortexed with glass beads for 10 minutes in 200 μl of 20% TCA, followed by centrifugation for 2 minutes. The pellet was resuspended in sample buffer and pH was neutralized with 2 M Tris buffer (pH 7.6). Proteins were separated by PAGE, transferred to a PVDF membrane and incubated with monoclonal anti-c-myc antibody (Covance) to detect myc-tagged proteins. Bands were visualized using ECL Plus Chemiluminescence kit (GE Healthcare). Lillian Doerfler, Lorena Harris contributed equally to this work. We thank the members of the Schmidt lab and Gary Daughdrill (University of South Florida) for helpful discussions, Richard Kolodner (Ludwig Institute for Cancer Research, University of California San Diego) for sending strains and Mark Longtine (Washington University, St. Louis) for plasmids. This work was supported by National Institutes of Health grant 5R01GM081425 to KHS. LD constructed yeast strains, performed experiments, analyzed data and performed statistical analyses. LH constructed yeast strains, performed experiments, analyzed data and performed statistical analyses. EV constructed yeast strains and performed experiments, KHS. designed the study, analyzed data and wrote the manuscript. All authors have read and approved the final manuscript.